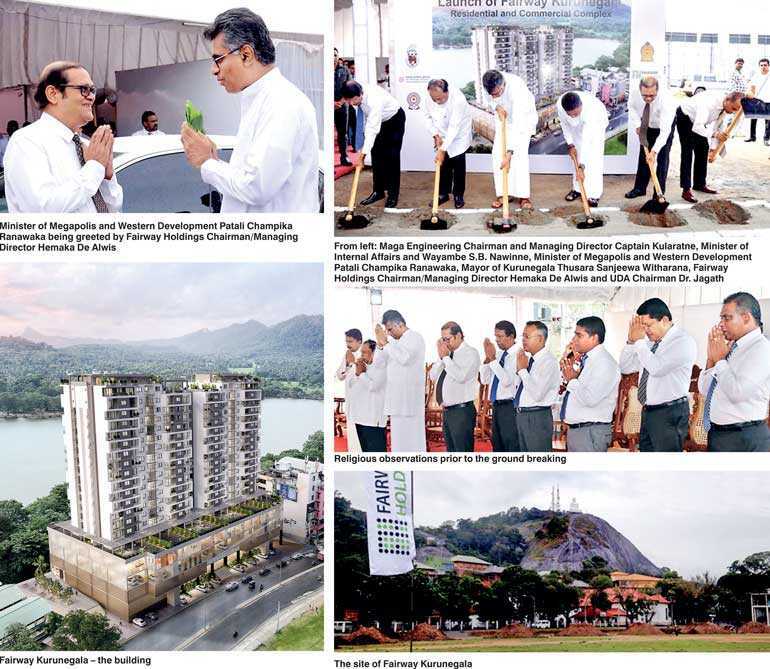 Fairway Holdings’ second venture out of Colombo was inaugurated with the ground-breaking ceremony for ‘Fairway Kurunegala’, a proposed mixed development building project, which took place on 16 August at the picturesque project site in Kurunegala, the capital of the North Western Province. The Chief Guest for the ceremony was Minister of Megapolis and Western Development Patali Champika Ranawaka. The Guest of Honour was Mayor of Kurunegala Municipal Council Thusara Sanjeewa Witharana. The ceremony was also graced by Minister of Internal Affairs and Wayamba Development S.B. Nawinne, UDA Chairman Dr. Jagath Munasinghe, UDA Director General Sumeda Rathnayake, UDA Director for North Western Province W.J. Senevirathna, Acting Director North Western Province Environmental Authority Saman Kumara Lenaduwa, RDA North Western Provincial Director P.A.S.M. Marasinghe and Maga Engineering Chairman and Managing Director Captain Kularatne. Fairway Holding’s entry into Kurunegala is in recognition of the city’s established importance as a major city in Sri Lanka and a vibrant regional business hub. A focal point in both the Central Expressway and the railway running from Colombo to the North, the city is a thriving wholesale and retail centre and contains a number of popular schools. Kurunegala was an ancient royal capital for 50 years, from the end of the 13th century to the start of the 14th century, and the area has an abundance of religious and cultural sites. The city is surrounded by large rocky outcrops, paddy fields, coconut estates and lakes. The proposed building, which will potentially be a landmark in Kurunegala, has been conceptualised and designed by senior architect Mohan Silva with maximum emphasis being given to comfort, safety and state-of-the-art conveniences. 75% of the building’s space will contain 180 luxury apartments, including four penthouses, and the balance 25% will contain a shopping mall with leading local and international brands, offices, a food court and beer garden, a supermarket and ample commercial parking. The use of environmentally friendly material for construction will ensure sustainability and longevity. Fairway Holdings is one of the pioneers in introducing vertical luxury living to Sri Lanka with its numerous projects mainly based in Colombo and its suburbs.